The Peoples Church Preschool was established in 1951 and became nationally accredited in 1998. 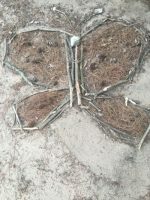 The school began its nature focus in 2002 and became an official nature preschool in 2013 after the director attended the first Nature Preschool Conference and joined the Natural Start Alliance. We would like to acknowledge our families and community volunteers for all they have contributed to assisting us in our pursuits for Nature Explore certification in our outdoor play space. Special thanks to our construction foremen, Fedon Pitsonis and Steve Holden and to the staff members at Nature Explore for their guidance and encouragement. In the spring of 2016, we added three new features to our space including an updated mud kitchen, a sound wall and a mini waterfall and stream. 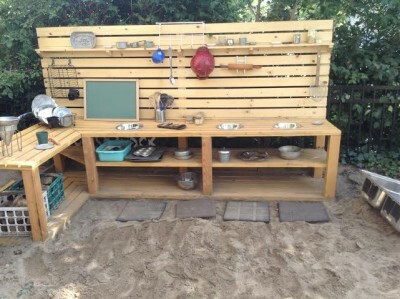 Our mud kitchen has 11 feet of counter space for mixing up mud creations. Our sound wall features a hanging steel drum and hooks for interchangeable parts so that new sounds can be created weekly. Our hose-fed waterfall and stream allows children to enjoy water play safely while making discoveries about how water moves and how it can be directed. Improving upon our outdoor space has been a great focal point for bringing families together for a common purpose and bonding. Many parents brought their children with them and made volunteering a family affair. Our outdoor space has become a place where our graduating children can leave their mark by painting and placing an alumni river rock near the garden. Many parents chose to photograph their children at the entrance to the outdoor play space on their child’s last day to preserve the memory of their time at Peoples Church Preschool. The longevity and uniqueness of our program brings many visitors from other schools for tours. 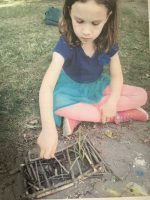 We are able to educate those seeking advice, that a natural environment for children is superior to purchasing expensive man-made equipment. Together we can build upon the movement that no child should suffer from nature-deprivation and that natural playscapes are the definition of quality, not only for early childhood education, but for all ages.